Guard tracking apps are everywhere. From super-expensive and complicated mobile officer management systems developed by software engineers with little/ no security industry experience, to “free” security guard apps to snag you into whatever gimmick they’re trying to sell you, choosing the right security guard tracking app can be very confusing. Call us to see if we can remove the confusion in finding an affordable, top-end security guard tracking app. At GuardMetrics we have developed a user-friendly, affordable guard tracking app, based on many decades of combined experience in the security guard industry; and close to that amount of experience in software and technology! Our Support Manager alone has three decades on your side of the fence, and has insured that—as much as our guard tracking app and security officer management system are capable of—it is easy to use. We even took care to develop this guard patrol app to work on iPhone, Windows-phone, Android; any mobile smart-device that you choose. And because the system was also designed to use nearly the same data as a text, your officers can even use this guard app on their personal device without it costing them on data or battery power! Call or click here to see how user-friendly a guard tracking app developed by security industry experts can be! Every event that your mobile security officer performs while on tour or patrol, and logged-in to the GuardMetrics GPS guard tracking app, is time-stamped and geo-tagged with a satellite photo; scanning a tag at a checkpoint, a line item on the Daily Activity Report (DAR), an incident report, the visitor log…all come to you showing you exactly where your security guard is. You no longer need to worry about a customer who tells you that they haven’t seen your officer on the property. Within minutes of such a call you can have the proof in front of them, showing them that your officers are doing exactly what your security guard service was hired to do. You can even provide a “Client Portal” to your clients through this officer management system, allowing your clients to view their reports any time they wish! Transparency = customer retention. Contact GuardMetrics to request a demonstration of the simple but capable GuardMetrics guard tracking app! Transparency also means winning new business! If you can offer a potential client complete transparency, then they know that that translates to complete accountability. Bringing that provable accountability to the bid table is a huge advantage over a competitor that can’t do the same. To further increase your competitive advantage, we will even produce a marketing/bid .pdf branded to YOUR security guard company, upon request. 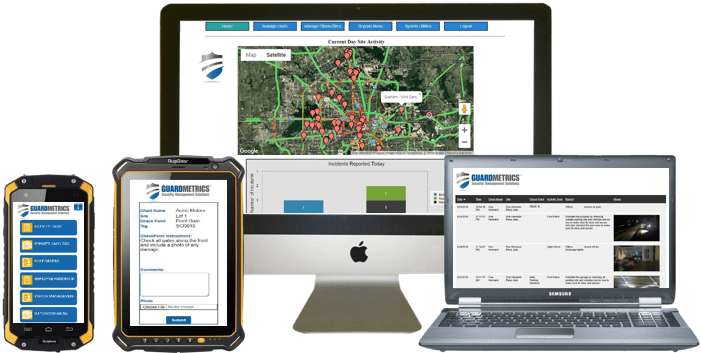 This guard GPS tracking technology, branded to your business, along with the additional services you can provide with the GuardMetrics guard tracking app, will set you apart from—and well above—your competition. Contact GuardMetrics today to see the guard tracking app capabilities above, along with many other benefits!